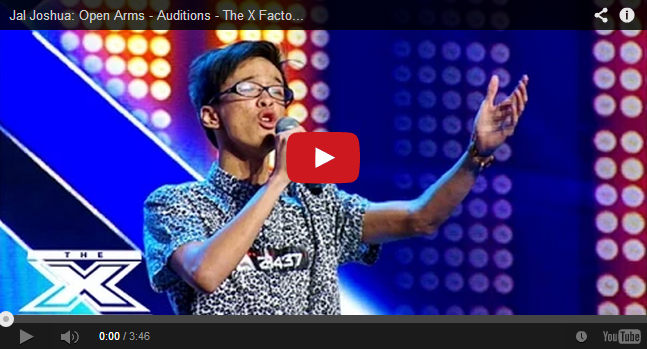 Amazing Pinoy named Jal Joshua performed "Open Arms" Got Standing Ovation at X-Factor Australia. The good thing about Pinoys or Filipinos is that whenever there is an opportunity, they will surely grab it. This is evident in so many competitions around the world wherein they competed and became popular. One of the said competitions is the X-Factor Australia wherein judges Ronan Keating, Dannii Minogue, RedFoo and Natalie Bassingthwaighte will have to approve or disapprove someone’s entry in the competition. Talking about the Pinoys who made it and will go to the bootcamp, here are they. For the record, all of them got standing ovation from the judges after their performances. Jal Joshua – Jal performed Journey hit “Open Arms” that really captivated the hearts not only of the judges but the audience as well. The crowd rose to their feet with his performance and Redfoo said that he wished his voice will change into Jal’s voice. This is because Jal said that he started singing at an early age and took a break from singing and took dancing. He loves performing and that’s the heart of it.